The inland Northwest lifestyle is very real. Here’s where we can live it. It’s time for some cold, hard facts. Spokane is growing. By 2040, the region will have added roughly 165,000 people. In other words, by 2040, the population of Spokane County will surpass 625,000. That’s not an insignificant number. In fact, that would put Spokane County at roughly the same size as the City of Portland. Consider the implications of such growth. More kids in schools. More homes and apartments in development (70,000 more units). More jobs and centers of employment (68,000 more jobs). And more cars on the road. Already we’re seeing the start of this wave of increasing traffic. Consider South Regal on a weekday morning, where the prospect of three new big-box stores is already complicating rush-hour commutes. Consider Five Mile or Country Homes, where traffic has increased and neighborhoods have grown by orders of magnitude without any semblance of mitigation. Consider Hamilton on any weekday afternoon, where an increase in student population is driving record traffic. Area drivers are complaining of increased commute times and lost patience. This traffic costs us precious dollars. The increased load weighs heavily on our streets, which must be more frequently resurfaced. The increased pollution caused by idling in traffic harms our environment. Perhaps most importantly, the lost working hours cost us millions of dollars every year in lost productivity. And there’s no sign of relief. The launch of the Facebook page of the Spokane Chinese Lantern Festival got me thinking about the different types of cultural events that would fit Spokane in the future. Not long ago, it was difficult to imagine these types of festivals taking place in our city. But with the rise in popularity of Craft Beer Week, Inlander Restaurant Week, Terrain and Bazaar, the Spokane Winter Glow Spectacular, and now the Chinese Lantern Festival, it’s not hard to see bright possibilities for the future. Personally, I think Spokane needs to next develop its winter offerings to include a German-style Christmas Market. In Germany, even small villages host Weihnachtsmarkten. Vendors sell hand-crafted goods, like ornaments, gifts, and toys. Typically, there’s fresh local food available, like wursts, kartoffelpuffer (potato pancakes), and other delicacies. Oh, and the glühwein (mulled wine) flows generously. Imagine how a small- to medium-sized Christmas Market could work in Spokane. I could see it taking place near the Rotary Fountain in Riverfront Park, to complement the soon-to-move ice skating rink in the Gondola Meadow and Spokane Winter Glow Spectacular, the large winter lights show. While open container laws would likely put a damper on any plans to allow patrons to roam freely with mulled wine, perhaps a wine garden (weingarten?) could be established. Or maybe a waiver of the open container law could be granted for this specific event, as has occurred in other cities. Either way, a Christmas Market would be a really cool way for downtown Spokane to continue to distinguish itself during the holiday season. There’s even the possibility of adding a Spokane-esque twist, like curated booths a la Bazaar, or maybe a way to include winter-releases from local craft breweries. With eight months to go, perhaps something could even happen this year. Let’s make it happen. What are your thoughts? What cultural festivals would you like to see take place in Spokane? Do you think a Christmas Market would be a good addition to downtown Spokane during the holiday season? What other new attractions would you like to see this Christmas? Lausanne, Switzerland, coupled with its environs, has a population of around 300,000. The city itself sits at 125,000. The Spokane metro area has a population of around 535,000. And about 210,000 reside in the city itself. Lausanne in 2008 became the world’s smallest city with a full-fledged rapid transit system. It has two lines, 28 stations, and provides 41 million annual rides. In 2018, construction will conclude on the third line on the system. Terrain is cool. If nothing else, this year’s event proved that. Terrain 7 received more submissions than ever before, and the resulting curated one-night-only event drew in a record number of visitors. Better yet, the burgeoning movement has launched a campaign for a permanent venue at its new home in the Washington Cracker Company Building on Pacific. TED is cool. The innovation and leadership conference has grown from humble beginnings into a worldwide phenomenon drawing thousands of changemakers every meeting and hundreds of millions of YouTube views. Which brings forth an interesting question: what would happen if Spokane brought together the hyper-cool creative atmosphere of Terrain and the innovative, entrepreneurial spirit of TED? Imagine a one-day-only conference focusing on innovation, creativity, and change. Imagine Spokane drawing together leaders in technology, the physical sciences, the social sciences, the arts, and others in a common, one-night festival of what’s next, what’s new, and what’s inspiring. We already have a TEDx event, but it’s small, limited in scope, and ineffective at building Spokane’s innovation culture. This conference needs to be big. Like, Convention Center or INB Performing Arts Center big. We need to inspire Spokane’s youngest kids to get interested in STEAM-based careers. We need to grow our startup infrastructure into something that can support a vibrant technology sector. We need to continue to develop strong events that build participation in local arts and culture. A TED-style event with the spirit, drive, and curation of Terrain could make that happen. What do you think? Would you like to see a TED-style event in Spokane? What do you think of adding Terrain’s signature style and curation? Do you think that such a move could help to inspire the next generation of local youth to explore STEAM careers? What about growing our startup or innovation culture? Share your thoughts and ideas in the comments, on Facebook, on Twitter, or in person. We love to hear from you. Spokane has a vested interest in decreasing the number of vehicle trips made per day in the city. Not only does driving alone to work markedly increase carbon dioxide emissions, but it also increases traffic, making Spokane feel more and more like a larger city. By taking drivers off the road and redirecting them to safe, convenient bicycle lanes, our city becomes more active, more engaged, more green, and more efficient. Unfortuntately, in order to do that, we must provide safe, convenient places to store bikes–and places to get ready for work. Enter the bicycle center. It’s a simple idea, really. Let’s build a location downtown with rows and rows of indoor, protected bicycle storage. Hire an attendant to staff the facility during operation hours, or develop a card-key or smartphone-activated access system. Offer shower and locker facilities, and you’ve got a bona fide bicycle transit center that can be open for users at least nine months of the year. You could charge a small “subscription” fee and offer a drop-in rate for more sporadic users. We’ve already got the STA Plaza. Shouldn’t someone cater to bicyclists as well? What do you think? Should a bicycle transit center be developed in downtown Spokane to encourage more workers to ride downtown? With increased bicycle infrastructure around the city, where would you like to see investments made to the system? Share your thoughts in the comments below, on Facebook, on Twitter, and in person. We love to hear from you. As with many cities, Downtown Spokane has a rich, colorful history. From the Great Spokane Fire to West Trent, from speakeasies to single-room occupancy hotels (SRO hotels). It’s a storied past, and one that comes with a lot of baggage. For the longest time, that baggage simply went unnoticed, and passageways and basements were lost and forgotten. But with the recent building remodels which have been going on downtown, these places have in some cases been rediscovered. STCU, for example, recently posted photos of the basement of the Hutton Building, where it has been completing a major renovation. And indeed, it does make us wonder: does Spokane have enough history in the basement tunnels and passageways and hallways to create a tour? Seattle’s Underground Tour is wildly popular, and to be clear, our city doesn’t have the same amount of interesting sites, but it would be an interesting pitch. What if Spokane had an underground tour? Any basements that you would particularly like to see? Any secret tunnels or passageways? Would you go on the tour? Let us know in the comments, on Facebook, or on Twitter. We love to hear from you! Spokane has a “brain drain” problem. Currently, many of our brightest high school seniors choose colleges and universities located on the coast, in cities like Seattle, Portland, San Francisco, and Los Angeles, or in the east, in areas like, New York, Massachusetts, and the Washington, D.C. area. (For example, this blogger attends Santa Clara University in the Silicon Valley.) That would be fine if those students moved back to Spokane upon graduation. But they don’t. Typically, these students leave Spokane when they turn 18 and don’t come back, perhaps partially because in-routes to established companies, economic opportunity, and culture are seen as more plentiful in those larger, more established cities. There’s “more to do,” more “people like me,” and “more jobs.” (Or so people think.) The brain drain continues. But what if we had a way to end it? We talk a lot in this community about bonds and levies. These tax measures are designed to allow for infrastructure investment, parks and recreation improvements, road construction, and school renovations. A small levy, or even a large grant from a charitable organization, however, would be enough to make a big difference in our “brain drain” problem. Let’s offer any high school senior in Spokane who wishes to pursue a career in STEAM (science, technology, engineering, the arts, and mathematics) a $5,000/year college scholarship. In return, the student would agree to move back to Spokane for a period of at least three years post-graduation (with postponement available for years of service and graduate school). Simple. Easy. These fields are constantly cited as the types of industries which our city must attract in order to remain competitive in the 21st century. So let’s do something about it. Let’s encourage students to go into STEAM fields. Let’s encourage students to move back to Spokane. Let’s grow our local economy by leaps and bounds. The best part is that this type of measure need not be expensive. A levy the size of the roads levy planned for the November ballot, for example, would make a big difference. $10 million/year for higher education is a small figure compared to the possible economic benefit of increased STEAM engagement in the area. Even a large grant or series of grants could be huge for area students. And with a requirement that student return to Spokane, there’s a good chance that we’d hook them in for good. What do you think? Could college scholarships/grants for STEAM students help improve Spokane’s local economy and increase the number of young, urban professionals? Would you be willing to pay $20 more per year in property taxes to fund scholarships for high school seniors? Disregarding a funding mechanism, what do you think about requiring that students move back to Spokane? Share your thoughts below, on Facebook, and on Twitter. We love to hear from you. What could help the Garland District become more vibrant, like South Perry? Spokane’s Garland District has a second-run movie theater, specialty retail shops and services, iconic buildings like the Milk Bottle, and popular and exciting events like the Garland Block Party. So why does it always play second-fiddle to South Perry? 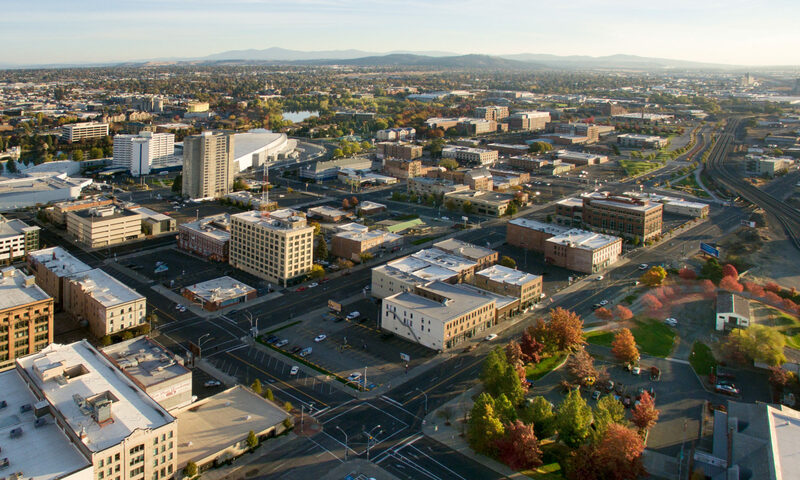 The South Perry District on Spokane’s South Hill has become a vibrant, exciting neighborhood since the 1990s, with hip restaurants and trendy, eclectic retailers, and further expansion incoming. It’s become a sort of model for other areas of town, a brilliant success story of a district’s revitalization. The Spokesman-Review thinks that the Thursday Market played a big role, and I’m inclined to agree. But what does that mean for our other major neighborhoods? The Spokesman article and a suggestion from Facebook fan Caleb Ingersoll made me start wondering: what could help the Garland District reach the same level of vibrancy, excitement, and virality? They already have a Street Fair, a Block Party that sounds like something that belongs in Seattle’s Capitol Hill neighborhood, and a second-run movie theatre. They also have the really cool and historic Milk Bottle, a sort of Spokane landmark. On paper, Garland should be blowing South Perry out of the water. But that’s not happening. Garland always seems to play second-fiddle to South Perry. I want to know what you think. Post your comments below in our comments section or on Facebook. Is it the lack of a destination Farmers’ Market? Do they need more hip restaurants and retailers? Streetscape improvements? Residential units? Let me know what you think.